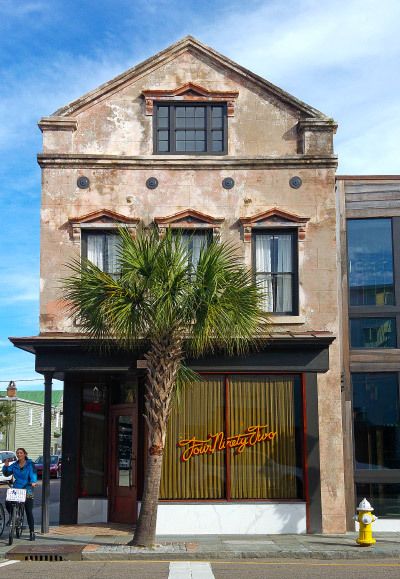 In December, we took a trip to US and Charleston was one of our stops. We also went to Savannah and New Orleans (which you can read about here). I wanted to show Mr. Texanerin the South and am so happy I picked those cities! One of the treats we enjoyed in Charleston were benne wafers, or crisp sesame seed cookies, which are a specialty of the gorgeous coastal area of South Carolina called the Low Country. Sesame was probably first grown in Africa and brought to the US, along with sweet potatoes, peanuts, collard greens, black-eyed peas and okra, by slaves in the 17th and 18th centuries. Why are they called benne wafers? Benne is the Bantu word for sesame seeds, which were thought to bring luck. Benne wafers are thin and crisp. That’s not usually my kind of cookie, and I’m not big on sesame seeds, either, but I actually thought these cookies were pretty addictive. I found a recipe on My Recipes that was pretty easy to make paleo. 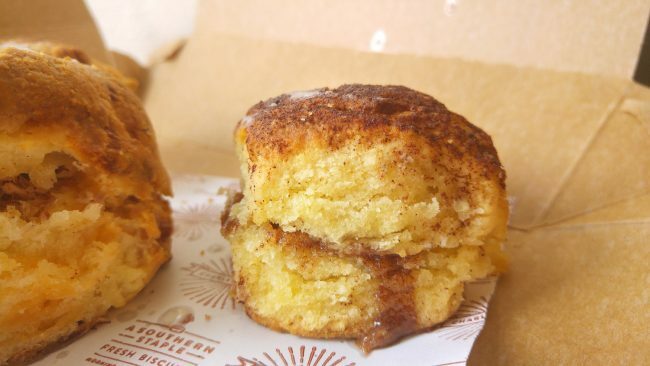 Just switch out the flour, sugar and fat and bam! Paleo benne wafers. And now I’ll tell you a bit the trip that inspired this recipe! Like I mentioned in my New Orleans post, the first thing we do in a new city is go on a free walking tour – the kind where you tip the guide at the end. We did one with Scott of Free Tours by Foot and loved him! He was super fun, knowledgeable and the tour gave us a bunch of great background info on Charleston. Before we discovered these tours, we’d just wander around cities on our own and not learn anything of the history. You get such a better understanding of a city after only a 2-hour tour, which is why we always make it our first stop. 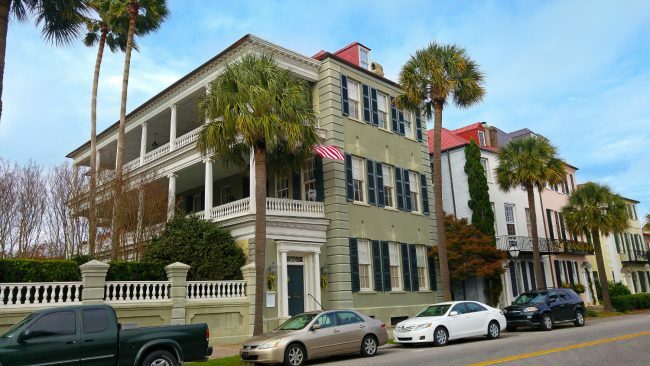 The architecture in Charleston is beautiful. If you don’t want to do a tour, you could just walk around for hours looking at the pretty houses. Above you see Rainbow Row, which is a series of 13 historic houses. 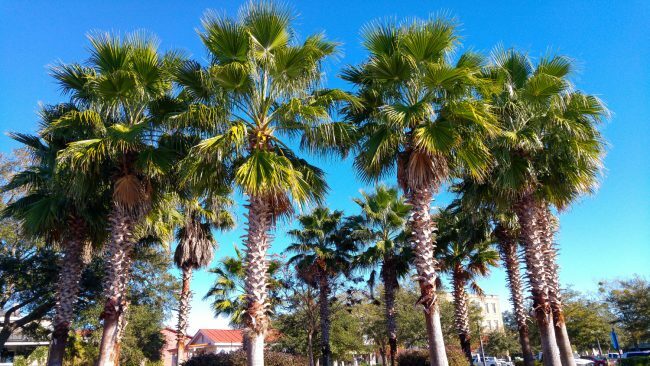 Is it weird that palmetto trees, one of South Carolina’s symbols, make me happy? 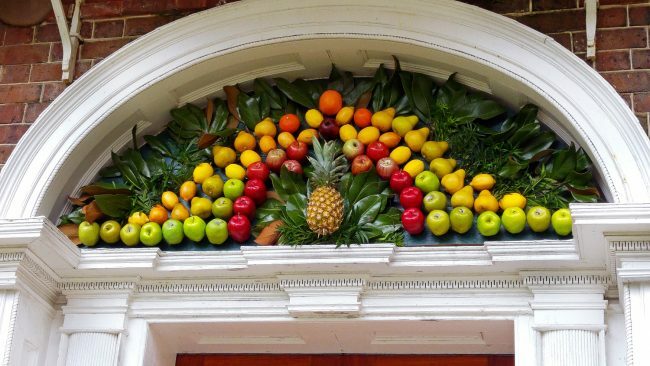 You’ll see pineapples, which are a symbol for hospitality, everywhere in Charleston. Apparently they were all the rage in American colonies and hostesses who offered pineapple were proclaiming their affluence. We also learned that sea captains would spear a pineapple on a stick in front of their house to let others know that they were home. I feel like a lot of US cities don’t have such an interesting history. Not all, but a lot of them. I mean, Dallas, for example, was founded in 1841. Nobody throw rocks at me, but I don’t find its history very compelling. 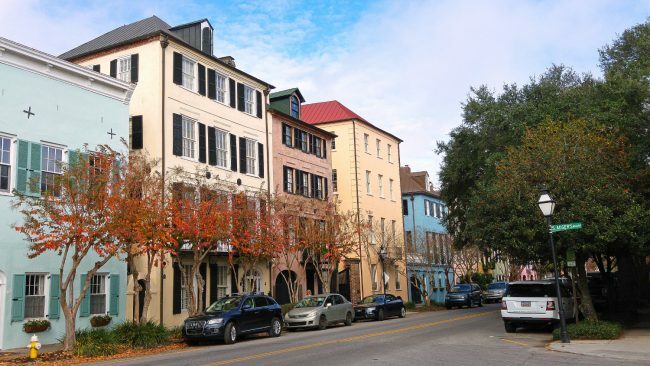 Charleston, though, was founded in 1670 and has a rich history and culture. The reason we went to South Carolina was to visit Caroline of Chocolate & Carrots. 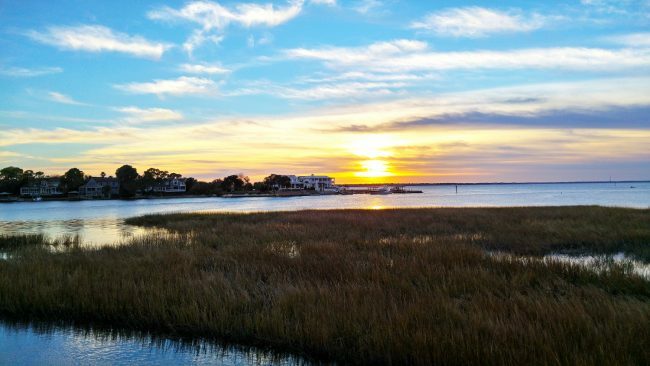 Her family lives in Mount Pleasant, which is just outside of Charleston and has lovely beaches where we could watch the sun set! 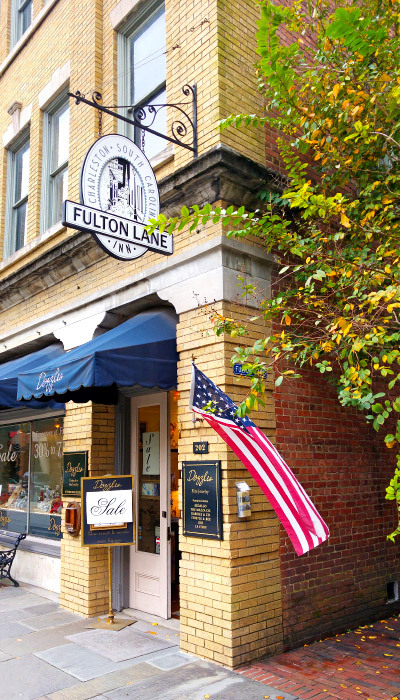 One night during our stay with Caroline, Mr. T and I went into Charleston and stayed at the Fulton Lane Inn, which is right on King Street – one of the main streets in town. We had never stayed in such a central location and LOVED how convenient it was to everything. In the past, Mr. T and I would choose locations that are a bit outside of the city center to save some money. We’re quite frugal travelers, I have to admit. ;) But staying here has spoiled us. 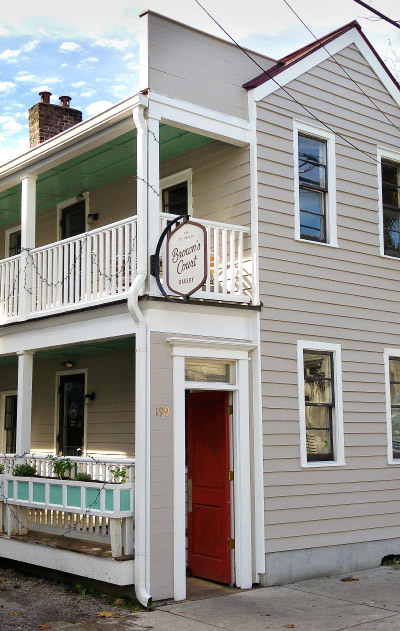 People were soooo friendly in Charleston and the staff at Fulton Lane Inn was no exception. Check-in is normally a straightforward, “Here’s your key! Now be off!” kind of thing but Zane, who checked us in, was so happy to give us tips, talk with us and to be honest, he was really entertaining. 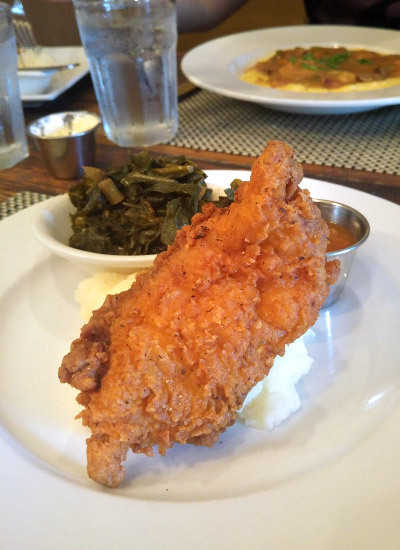 If you’re looking for Southern hospitality, then Fulton Lane Inn is for you. But back to the inn! 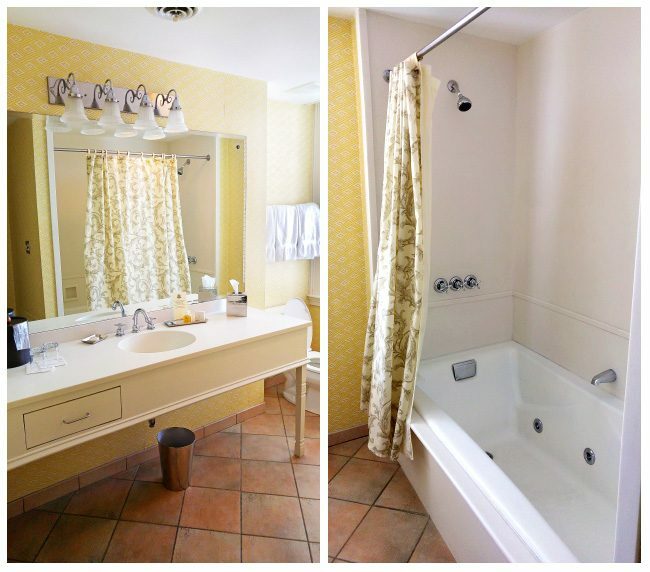 The bathroom was huge. Like twice the size of your typical Berlin kitchen. :D And immaculate! Every evening, they have a wine and cheese reception as well as evening sherry. We thought that was a fun way to meet others and get the evening started! Our room even had a living room and a full kitchen. How cool is that?! We normally love to have a kitchen but there’s so much amazing food just footsteps away I don’t know if you’ll need it. Cooking was the last thing on my mind but it was pretty awesome to have a fridge and a microwave to reheat leftovers! 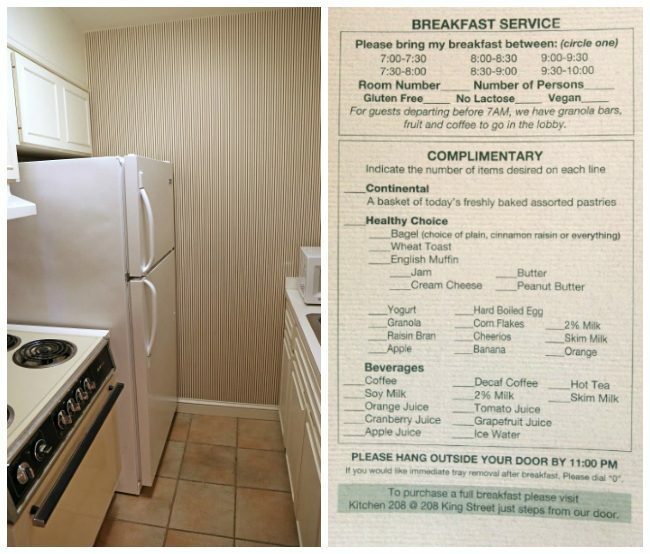 Another option for breakfast is Kitchen 208, which is also next-door, but the other way! 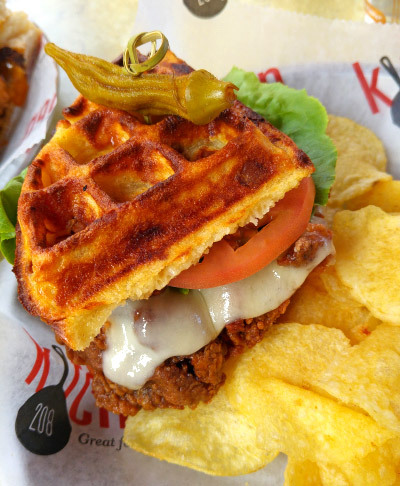 When I saw the Belle Gem, which is buttermilk fried chicken on a bacon waffle, on their menu, I was sold. It was so, so good. I’ve read that they have an awesome brunch so be sure to check that out if you’re there on the weekend! It was such a great stay. We had no complaints and would love to go back when we’re in the city again! Seriously, y’all, that location can’t be beat! 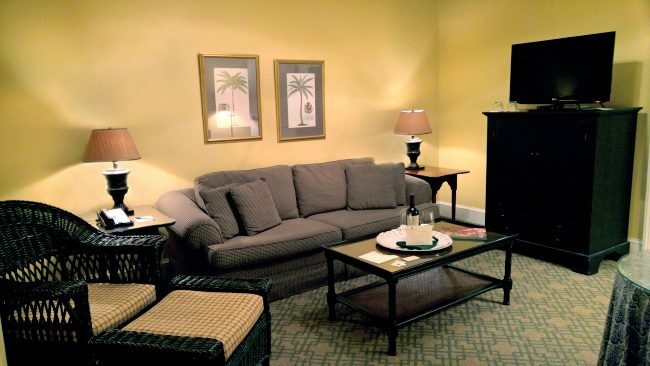 The cozy, charming rooms, the amenities and welcoming staff were just icing on the cake. :) Whether you’re looking for a romantic getaway or a trip with family, I think it’s an awesome choice. My only problem with Charleston is that there were too many amazing places to eat and so little time. This biscuit came from Callie’s Hot Little Biscuit. We got three different types of biscuits for $5 and wished we would have gotten more! I sure miss biscuits. There’s not even a word for them in German because they don’t exist here. Poogan’s Porch was great for lunch. 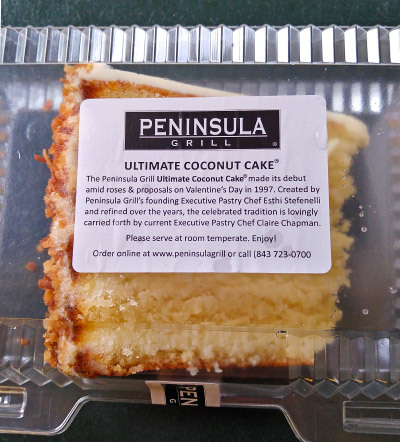 When looking for restaurants with Low Country specialties, they stood out. We seriously thought about ordering every starter and a main dish. I really wanted to show my German that American food is a thing (not just hot dogs and hamburgers like so many Europeans seem to think) and that it’s amazing. 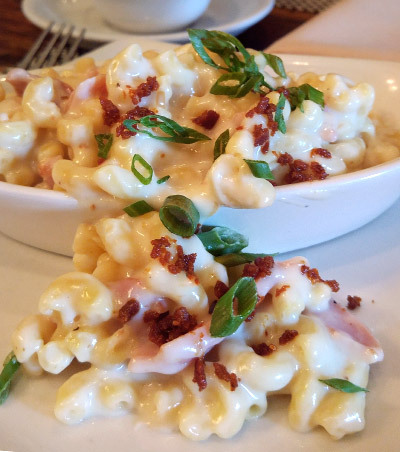 My favorite part was the smoked Gouda mac and cheese! And the biscuits. I do wish there had been more to my buttermilk fried chicken platter, though Mr. T’s portion of shrimp and grits was very generous! He felt so incredibly full after eating that and a cup of she crab soup that we had to go back to the hotel and nap for a while. During our last few hours in Charleston, we visited 5 different bakeries. 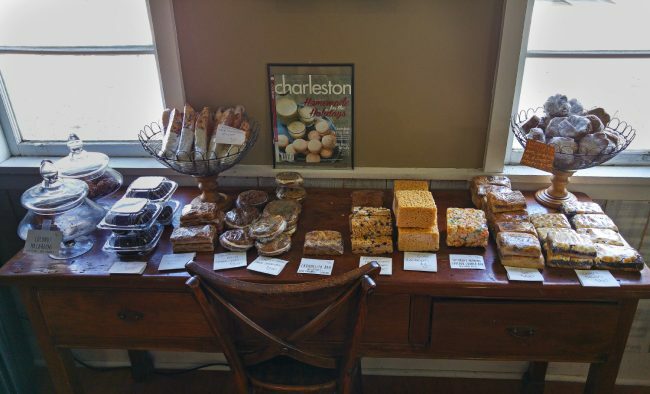 I had plans to write this great bakery guide to Charleston but we were disappointed in most of them. I don’t want to badmouth any of them so I’ll just tell you about the one that we did like! 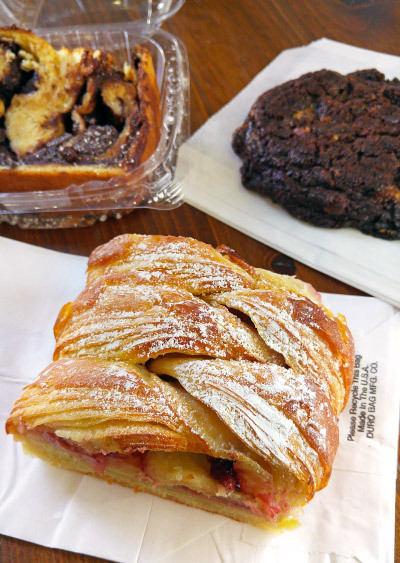 Brown’s Court Bakery had a great selection of fresh pastries, bread and other sweets. They also had a section with pre-packaged homemade goodies that you could grab on-the-go. My favorite was the chocolate babka! We really liked everything we tried, though. One day was definitely way too short for Charleston and we know that we’ll be back. What are some of your favorite places in the city? Preheat the oven to 350 °F (175 °C) and line a baking sheet with a piece of parchment paper. In a small mixing bowl, stir together the almond flour, salt and baking soda. Set aside. Bake for 8-10 minutes or until lightly browned. They'll be soft when you remove them from the oven but will crisp up as they cool. Cool completely on the baking sheet and then put away in an airtight container. These get soft if left at room temperature. Will stay crisp for at least 4-6 days. If you use white whole wheat or all-purpose, these will come out looking less like lace cookie-like. I like to use refined coconut oil, which doesn't have any coconut taste. You can toast them in a dry skillet over medium heat. About 3-5 minutes should do it, while stirring occassionally, or until lightly browned. You can also bake them on an ungreased baking sheet for 8-10 minutes at 350 °F (175 °C). Keep a close eye on them to make sure they don't burn! 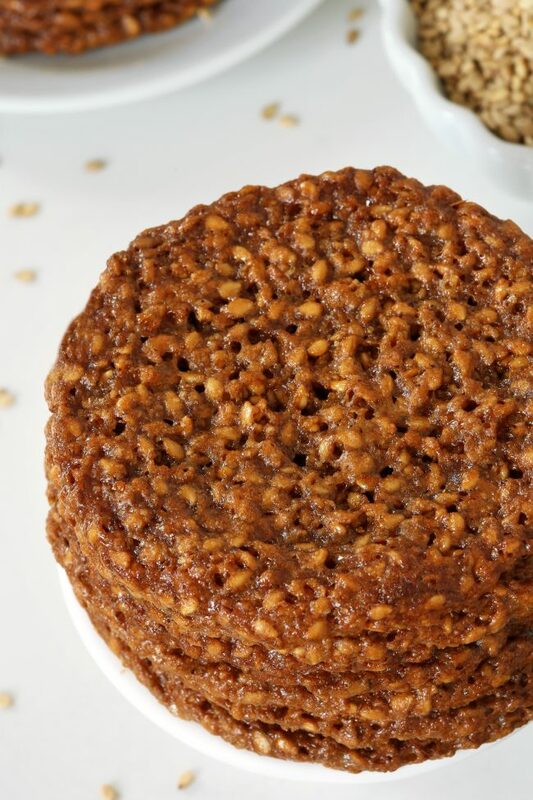 27 comments on “Paleo Sesame Cookies + 24 hours in Charleston” — Add one! I made the sesame cookies for myself. I have celiac and used 1 to 1 flour. They are awesome but my husband is gobbling them up. Too tasty! Haha. It’s always a good sign when the husband wants to steals the cookies. ;) I’m so happy you both enjoyed them! Thanks for your comment. Another great recipe! I used almond flour, coconut sugar and coconut oil..and they turned out as pretty as they are in your pictures! smelled heavenly and the taste was amazing. 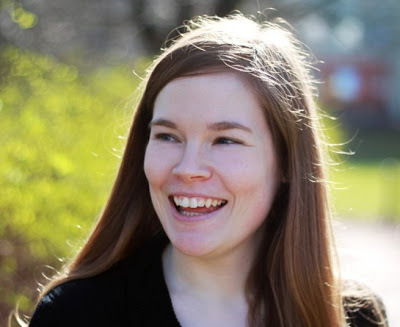 Hallo Erin, vielen Dank for your posts! I simply love your recipes. I am from Brazil moving to Germany in 2 years. Herzliche Grüsse ! I keep meaning to get up to Charleston! Great pics! 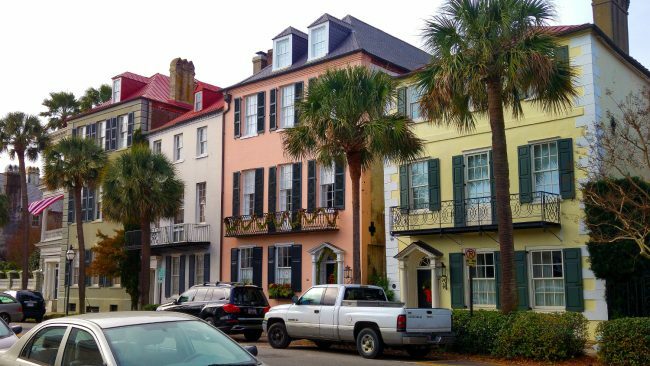 What a great post, I would love to go to Charleston, I agree I adore cities that are steeped in history!! The Fulton Lane Inn would be exactly where I would love to stay. 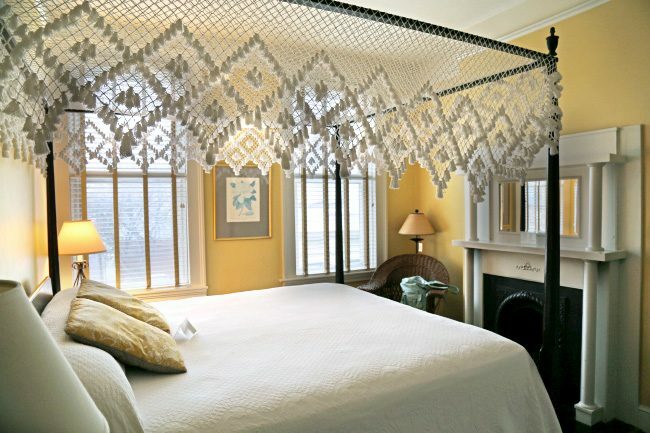 That four poster bed is magical!! I’ve never been to Charleston but it’s been on my travel bucket list for ages!!! This hotel looks beautiful! 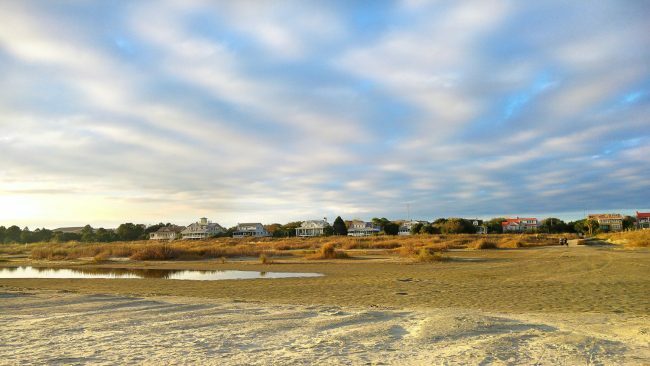 What beautiful photos — now I want to visit Charleston too. Looks like a beautiful (and tasty!) place. Too bad about the bakeries though. As for history in the US, it’s a curious thing to me. When I traveled in Europe in my teens I was struck by how much history was there, and how long the history was. I felt like the US just couldn’t compare. But as I’ve gotten older, I have come to appreciate the storied history that does exist — particularly in New England where I live. It’s there, and it’s interesting, but it’s not as easily accessible in a lot of places, I think. I could be wrong though. What a fun trip! I have always wanted to go to Charleston but haven’t had the opportunity to get down there. Those houses – swoon! I had no idea that sesame cookies would be popular down south but I think they look awesome! Sometimes I’m all about a crispy little cookie bite. Those are the totally the perfect southern cities. I need to have a trip to Charleston soon! I love the pineapples everywhere. They’re all over Williamsburg too. Ps. love the cookies! Who needs a walking tour when we’ve got you!? 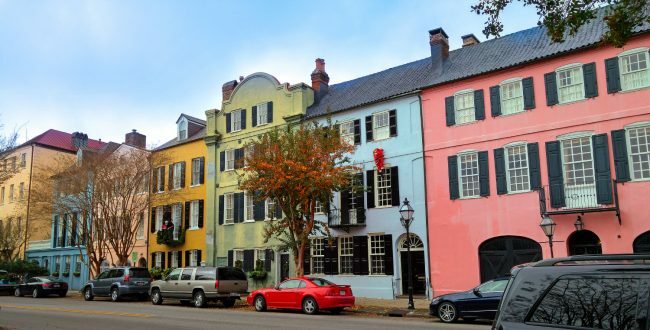 :) Okay, I admit…this post just made me want to visit Charleston even more than I already did. Such a beautiful city, and these cookies look amazing. I love sesame seeds in sweets, so these are right up my alley. We love Charleston!! 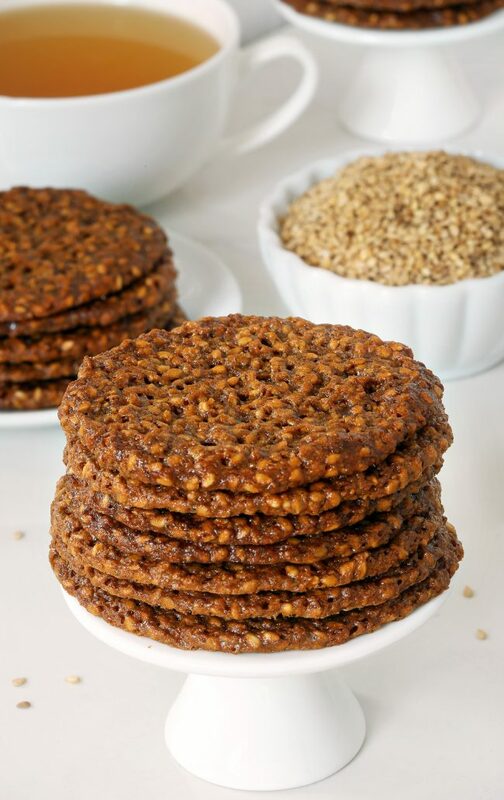 And these sesame cookies look and sound terrific, I can’t wait to try them! Charleston is just so pretty. I love the houses and I wish we would do another road trip and head to that area again. How nice you got to visit your friend and show your husband so many cool parts of America. Lovely cookies, Erin!! I just adore Charleston…it looks like you had fun. I love Charleston and haven’t bene there in ages! What a fun trip! 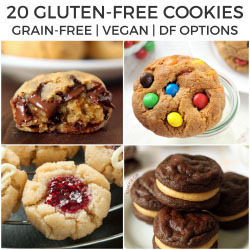 You are truly the queen of healthier dessert, these cookies look amazing! These cookies look to die for and I am loving all the city pictures. I truly love Charleston! I think our youngest son stayed in Charleston a few days on a business trip a few years ago. I have never been. He lived in Charlotte, NC for almost 5 years. Not sure how far away that is from Charleston, SC. Now he lives back in GA about 35 mins. from us. So nice too. He lived away about 7 years total. I must be the only food blogger who does not travel!! Lol, but I have to admit, you make it look like a lot of fun and those cookies sound delicious! Now I know why I bought toasted sesame seeds a few weeks ago! ;) I would love to visit Charleston, love your photos. What a fun trip! 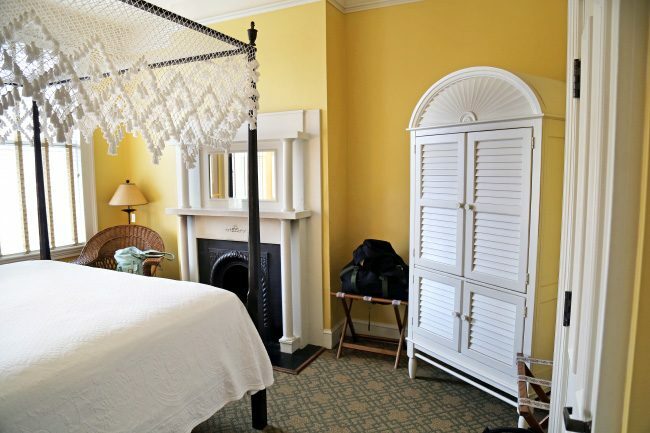 Love the cute little room, and southern charm. Such yummy looking cookies too!